Frank Wolf is Canada’s most diverse adventurer. 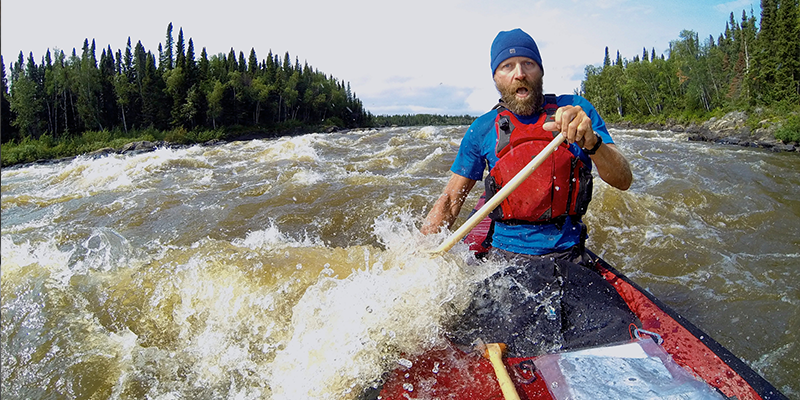 In the past 20 years he’s done an impressive single-season canoe expedition across Canada; whitewater kayaked in Cambodia and Laos; cycled the frozen Yukon River in the dead of winter; and sea kayaked around British Columbia’s Haida Gwaii. Frank has also hiked, packrafted and sea kayaked the proposed Northern Gateway pipeline and supertanker route from Alberta’s tar sands to the Pacific Ocean. To add to his impressive resume, last summer Frank was part of a four-person team who attempted to row the Northwest Passage. Wolf’s expeditions share a mind-boggling degree of difficulty, revealed through creative (some might say impossible) route selection and personal suffering along the way. Even more impressive is Wolf’s ability to film insightful and humorous documentaries along the way. One Response to "Frank Wolf: Canada’s Most Diverse Adventurer"
It was great fun, and quite a different way of making a presentation than I’ve done in the past. Lots of variety, of subjects and speakers.